The Trans-Siberian Railway (Russian: Транссиби́рская магистраль trahns-sigh-BEER-skuh-yuh mah-gee-STRAHL&#146; or Трансси́б trahns-SEEB), or Transsib is the name given to the three rail routes that traverse Siberia from Moscow. The Trans-Siberian proper goes from Moscow to the Pacific terminus of Vladivostok. The Trans-Mongolian goes from Moscow to Beijing, China via Ulaanbaatar, Mongolia. The Trans-Manchurian travels through Siberia and Manchuria to Beijing. The Trans-Siberian Railway is the longest railway in the world. It was built between 1891 and 1916 to connect Moscow with the Far-East city of Vladivostok. En route it passes through the cities of Perm, Yekaterinburg, Omsk, Novosibirsk, Krasnoyarsk, Irkutsk, Chita and Khabarovsk. Cutlery Instant noodles, or its Russian version - instant potatoes, become essential snacks for most travelers, since each carriage is equipped with boiling water from the Samovar, unfortunately they often come without the usual plastic fork or spoon. Perfumed wet tissues/baby wipes/wet wipes These little things can do wonders for your personal hygiene. Head lamp On these long journeys (through 8 time zones), it often turns out that Einstein indeed was right - time does become relative. So bring a headlamp for reading when others want to slumber. Deck of cards or other easily explained games are great for socializing with your fellow travelers, and making the long hours spent on the train immensely more enjoyable. Bring a deck of 5 Crowns for this is a favorite in Russia. If you are a chess player, by all means bring a little chess set - the game is really very popular in Russia. Pictures of your home, country and family and a phrasebook with a conversation section (Lonely Planet's phrasebook is a good one) can work surprisingly well, since you'll have nothing but time to overcome the language gap. Many Russians tend to be curious about foreigners once the initial suspicion dies down, since they don't normally meet many - even these days. Recommended: make a list of vocabulary and study it in the train! Itinerary There are many ways to "make Trans-Siberian", think carefully which cities you want to make stops in depending on your passions and interests. Explore Russia  gives support in planning a route, suggests places to visit and can help with booking tickets and accommodation. 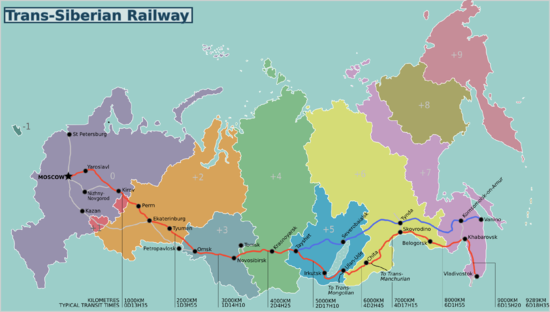 The three termini of the Trans-Siberian are Moscow, Beijing and Vladivostok. There's also a weekly connection from Moscow to Pyongyang. Moscow can be reached by train from anywhere in Europe. Fares from London (one-way) start at around £200. Eurolines operates the European coach system, and fares from London start from around £60. Aeroflot is the principal airline operating into and out of Moscow. Extending the Trans-Siberian experience is possible by travelling on the Paris-Moscow service, a direct Russian train from Paris to Moscow via Germany, Poland and Belarus or Nice-Moscow via Monaco, Italy, Austria and East Czech Republic. Ferries run throughout the year between Vladivostok and Fushiki, Japan. The trip takes about two days. Arrangements can be made through Business Intour Service, who have offices in Tokyo and Vladivostok. Ferries also run from Sokcho and Donghae, South Korea to Vladivostok. Aeroflot and Vladivostok Air  serve Vladivostok, amongst others. Beijing is served by numerous international airlines. It can also be reached by train from as far south as Lhasa (Tibet) or Ho Chi Minh City (Vietnam), but there are no rail connections to Thailand, Myanmar or India. Most travelers will need visas for all three countries except if you are going to Vladivostok or Sakhalin by Trans Siberian route without visiting any other countries apart Russia, e.g. by the main Trans-Siberian line or BAM. China and Mongolia are fairly straightforward. The best way to obtain a visa is through your own embassy or consulate or in Hong Kong. Visas for British citizens cost £30. However, Mongolian visas can easily be obtained from the Mongolian consulate in Irkutsk (Russia), and Chinese visas in Ulaanbaatar. (Note: For the moment it is recommended to apply for Chinese visas in Mongolia, due to no regulations.) US and Brazilian citizens (90 days) as well as Israeli and Canadian citizens (30 days) do not need Mongolian visas. Russia is more problematic. Invitations are generally required for issuing a visa. Practice shows you can get it from online services like Russian-visas []. Tourist visa gives you up to 30 days in the country. Business visa is a choice for people who want to spend up to 90 days, however, it might be more complicated to arrange. US citizens can get a 3-year, multiple entry visa. Israelis and Brazilians do not need Russian visas (90 days). Every foreign tourist has to get registration for stays in one place of more than 7 working days (9 days with weekend). Hotels provide it for free most of the time, some hostels will do it for an extra charge. Apparently any Russian can register you in his/her house at the post office for a small fee. If you stay less than 7 working days you don't have to register legally. In any case, it is advised to keep all your tickets with you. However, Russian transit visas issued in Beijing, Shenyang or Harbin last 10 days and require no invitation. This would be enough time to make the trip with no stops along the way and spend a couple of days in Moscow. The Beijing consulate is open from 9:00 to 11:00 but remember that many Chinese nationals are also trying to acquire visas with you, so show up early. The Shenyang consulate is open from 9:00-12:00 for visa services drop-off and 15:00-16:00 for pickup, and is far less crowded or strict than Beijing. The cost varies for each nationality, but Americans can expect to pay $250 for same-day service or $150 for the five-day service. Upon arrival in Moscow you have four nights valid on your transit visa, which allows for one or two nights in Moscow, an overnight train and one or two nights in St. Petersburg respectively, but you must be across the border before midnight on the final day of your visa. There are many exits from St. Petersburg, including buses to Helsinki, Tallinn, Riga, Kiev and various other places in Europe, but be wary that nearly all nationalities need a transit visa (or tourist visa) for Belarus (see here if unsure) so be sure to be prepared with a visa if your plans take you through Belarus. An exception is the once weekly ferry from St. Petersburg to Lübeck (Germany). See: . It is a great way to leave (or to start your journey to Russia). It is generally assumed that border police stationed at bus routes that exit the country are less likely to make a fuss versus the police on trains. A Russian transit visa cannot be extended under any circumstances. If you arrive from Beijing, you can register your visa after arriving in Moscow. If you have a 10 day Transit Visa and do not stay in one place (go to Saint Petersburg) you do not have to register your visa, though it is recommended that you register your visa, if possible, within three days of entry into Russia. Unfortunately, if you encounter police officers they might not have the same opinion and you could be faced with a "fine". Have your ticket ready as proof that you were unable to register sooner and keep all receipts from hotels and/or hostels from places where you have not registered. There are several ways of buying tickets for the trip. You can purchase them from a travel agent in your own country, a travel agent in the country from which you will start the journey or turn up and buy tickets yourself – or you use the online booking system of Russian Railways . The first option is safe, but most expensive, the third the cheapest but riskiest – and the last is easy and the cheapest. Popular trains can be sold out well in advance, particularly in peak season. For some trains in peak seasons there is no public sale, these tickets are only sold to certified travel agencies. 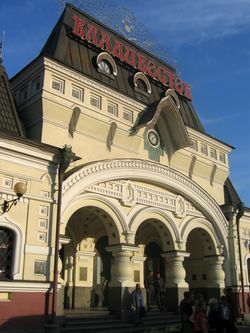 Russian tickets, also to Mongolia and China, at Russian fares are sold via Russian Railways (see above) and in English via Transsib GmbH [https:transsibirische.wordpress.com], more expensive by agencies like VisitRussia  or others (Transsib Reisen St. Petersburg ). Normally it is said to be possible to buy the tickets in any Russian station, not necessarily one on the route of the train. Russia, Ukraine and Belarus have a common ticketing network, so it is possible to buy a ticket for a Russian train in those two countries (eg. Brest), and it will probably be even cheaper than in Moscow. The difference occurs for several reasons, including whether additional insurance is present or not. All tickets include a small mandatory insurance, but cashiers will try to sell you additional insurance (150-200 RUB) by default. Selling it by default is prohibited and you always have the option to opt-in or opt-out: just say bez strakhovkee (без страховки, without the insurance) or so strakhovkoy (со страховкой, with the insurance). The ticket itself is issued on two layers of orange paper, insurance (if included) is a pink/green paper of the same size. If you live in Germany you can buy tickets for Russian trains at any "Bahn"-Counter (German Railways). The problem is that some Russian trains are sold out weeks before departures. In some stations in Russia, there are still special windows for selling tickets only for foreigners, but the price of tickets should now be the same for foreigners and local people. Tickets are normally individual, with name and passport number written on them, so you may need to show passports for all travelers when you pay (although a passport photocopy usually is enough). Also, if you plan to buy tickets on more than one occasion, it may be useful to keep handy a piece of paper with the travelers names written in the Cyrillic alphabet instead of transcribing them each time. In Beijing, you must buy tickets in person from a hotel travel agency near Beijing's main train station. Tickets can be purchased online, but you have to receive a paper ticket at the station anyway. You cannot board a train with just a printed copy of your order confirmation. For some trains and classes you might be able to "check in" online (at the time of purchase), which means the conductor will have a list with your name on it, so you won't need a ticket - you just show your passport. Arrive to your station of departure at least 180 minutes in advance (queues may be extremely long) and go to the same cash desks where you would normally buy tickets. Hand over your passport and order confirmation (or just the order number). The cashier will issue you a paper ticket for no additional fee. Besides this, railway stations in Moscow and other bigger cities, have self-check-in counters where you have to enter your order number and surname, and the ticket will be printed automatically. Buying tickets at the official Russian Railways website at http://ticket.rzd.ru, english: http://pass.rzd.ru/main-pass/public/en is very good and easy to use and a lot cheaper than through an agency because there will be no processing fee, however you will need a credit card issued by a Russian bank to make a reservation. You can also select the railway car and your seat/place. Tickets within CIS countries are also available. However, tickets to China and Mongolia cannot be bought online. Station numbers are used internally in the Russian railway computer system, but they are usually printed on the tickets as well. Knowing them may help when making the reservation in smaller stations (you could bring this page and use it for pointing), or when buying the tickets abroad. Unfortunately between Russia, China and Mongolia respectively there are no platzkart couchettes but only sleeping cars (Russian Kupe is similar to an European 1st class couchette, however classified and priced like a sleeper). To avoid extremely high fares go to Ulan Ude and take the daily bus up from there to Ulaanbaatar, about $25. Avoid ticket scalpers in Ulaanbaatar in all circumstances, they charge you $500 or more for the international train to Peking. Take a local train instead for $15 to the Chinese border at Zamin Uud. Buying tickets at affordable fares is possible if you get them in Russia. Beware of ticket scalpers especially in Germany charging you triple and more. Moscow-Vladiwostok or vv. soft sleeper $873 in peak seasons 2014 and $695 in low seasons from Transsib Reisen GmbH St. Petersburg. You must book until day 50 before departure in all circumstances because a new demand-related fares' system has been introduced on 03-01-13. Moscow-Beijing or vv. 2014 same company soft sleeper $775 and hard sleeper $531. in English. in German. Travelling the opposite direction, Moscow to Beijing, can be considerably cheaper, depending on the season. Reports show that the government has raised prices recently. Prices will be cheaper if you deal directly with them instead of resale agents, but that rules out English help and visa sponsorship, so be confident in your Russian if you deal directly with the government agency. The Trans-Siberian trains have varied schedules: some trains are daily while some go on even dates, some on odd dates and some trains depart only on a couple of days during a week. There are also passing-by trains (проходящие поезда), which are actually legs of longer train itineraries.For example, a Ekaterinburg–Irkutsk leg of a Moscow–Vladivostok train. In this case, not only schedules but also availability are affected: such tickets become available for sale 72 hours before departure. All trains in Russia run in Moscow time. Departure and arrival times given in the timetables or on the tickets are always Moscow time (except stations outside Russia). There are 10 time zones in Russia. Russian Railways has all Russian train schedules, as well as some of the international trains departing from Russian destinations (such as Moscow–Beijing train). Only actual availability is shown, which is released 45 days prior to departure for all Russian trains except for the passing-by ones and 30 days for most international trains. You will need to use alternate spellings for some destinations. Beijing is called Pekin, Moscow is Moskva, Saint Petersburg is Sankt-Peterburg, Yekaterinburg is Ekaterinburg or Sverdlovsk (old name of the city), Ulan Ude is Ulan-ude, Ulaanbaatar is Ulan-Bator, Almaty is Alma-Ata, and Khabarovsk is Habarovsk. Other good options for doing your own planning includes the Deutsche Bahn travelplanner . It's available in many languages including English, French, and Spanish. It has less transliteration issues that the Russian websites, but it includes only the limited firmeny "fast" trains. Another good option is the Poezda railway table (search Google) one of few online scheduling tools in English that doesn't try to sell you tickets, and it has a nice simple interface to boot. Coming from Beijing or Harbin, the last stop in China is Manzhouli. The food being sold there is quite expensive, but many Russians stock up on provisions (i.e. spirits and beer). Be aware that you can take a maximum of five beers (Harbin Beer, 0.3l) per person into Russia or you will have to pay a penalty (read: bakshish) to the customs. Get rid of all your Chinese Yuan here as they become virtually worthless once abroad, unless you want to take them as a souvenir. There are a couple of black market money changers in front of the station that change renminbi to rubles at ripoff rates. To get rubles, you have plenty of time on the Russian side of the border (Zhabaikalsk). Walk to the ATM located at the bank in town. Allow 30 minutes to go and come back. The train stops for several hours while the carriages are being changed, so you can do some shopping at the local food supermarkets (bread, cheese, etc.). Coming from Beijing via Mongolia into Russia there are still the same rip-off exchange touts, but most if not all platform vendors in Mongolia and Russia take U.S. dollars or euros. However, they take only bills (or notes), so know the exchange rate and buy a lot if you are using a five euro note. Always ask the attendant how much time is available before you rush off into a station to find a Bankomat (ATM) because the train will not wait for you. If you are not spending time in Mongolia, avoid acquiring Mongolian tögrög. They are worthless virtually everywhere else, and the export of tögrög is technically forbidden. Therefore, spend dollars or euro, but get rubles immediately because Russian vendors are more likely to fabricate exchange rates than Mongolian or Chinese platform vendors. On the Moscow–Vladivostok route) the train stops for 20–30 minutes every 3–4 hours. Everybody can get out of the train, and there are always people on the platform that offer a variety of fresh food (eggs, fish, cheese, bread, fruits, meat or cheese in a cake) and often some drinks for passengers. Prices are low; only Russian rubles are accepted. A highlight is the smoked fish (Omul) being sold on the shore of Lake Baikal (Station: Slyudyanka, a quick stop, so be fast). Some of the larger stations will have food marts with snacks but it is now (2014) difficult to get alcohol within train stations or at the kiosks on the platform. 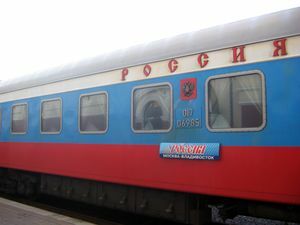 Many of the trains have dining cars (with extremely overpriced food and drinks), although if you do not speak any Russian, ordering the food will be an experience, to say the least. Food and drinks are also sold in kiosks at the platforms, but normally twice as expensive. To get a reasonable price, wait for a station with a 20–30 minutes stop, and just exit the train station, there is usually a plenty of kiosks or small shops just outside, offering a wider choice. Since there is a samovar (hot water dispenser) in every carriage, your best bet is to have a stack of dried noodle soups and Nescafe ready. Just bring your own cup. The carriage attendants (Provodnitsa, Provodnik if male) will often have cold drinks, snacks, and even freeze-dried meals available for sale at slightly inflated prices. In every train car there is a pot with boiling water available for making hot drinks (bring your own tea, but the water is free). Carriage attendants also sell tea and coffee, and it's usually possible to buy soft drinks and beer in the restaurant carriage to bring back to your carriage. It's worth having a basic phrasebook as attendants are unlikely to speak English and the drinks provided won't come with milk or sugar unless you specifically ask for them. First class (SV) is the most comfortable but is also the cost of the journey compared with a kupe. Each cabin consists of two sofas flanking each side of the compartment, which convert into beds for sleeping. On some trains such as the Trans-Mongolian, the first class compartments has private bathrooms. Service on the first class actually somewhat resembles the service you would expect in Europe and North America, which is worth considering since Russian railways are notoriously bureaucratic and not very service minded, to say the least. 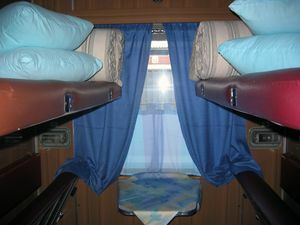 Second class (Kupe) somewhat compares to the standard on Western European sleeper trains, although with the Russian sense of knickknack decoration. These carriages are compartmentalized, with each compartment holding 4 beds. The lower right bed is 5 cm smaller than the others. One thing of note when buying tickets for second class, is that you will have to share the two lower bunks during the day. There is one shared bathroom on each carriage, that is locked during stops at stations. Kupe is a good compromise between relative comfort, and the ability to meet and mingle with the Russians, a situation where they are notably more open minded than what is usual in Russia. Third class (Platzkart) bears some resemblance to the hard sleeper class on Chinese trains: many travelers find this class to be much better than its reputation. These carriages are in an open layout with two lower and two upper berths, and small, narrow corridor and another two berths that are located on the opposite side below and above the window. There is little in the way of privacy here, but women travelers might prefer this option, or they may get stuck with three men and a closed door. The provodnitizas, or carriage attendants, are notorious for running the place as a boot camp. On the other hand, it is a taste of real Russia, and the price is usually 40–50 percent lower than kupe. Note that sometimes there is no shower in the train even in the first class on K19 (Trans-Manchurian). You can have an Asian-style hot shower, though, if you bring along 2 jars. Fill one up at the hot water dispenser, go to the washroom and mix the water you get there in the second one. The journey on the Moscow-Vladivostok route seems to be very safe, especially if you travel in groups of four (or multiples); then you will get a separate four-bed cabin (Of course, this applies only to kupe seats). Every train car has one or two staff (provodniks/provodnitsas) that check tickets, do cleaning, take care of boiling water, etc. Cabins can be locked from the inside with two locks. One can be opened from outside with a special key, the other cannot be opened from outside, and when locked allows the door to open a bit. This page was last edited on 5 March 2019, at 23:47.